Thanks, in the meantime. "Walking, praying, working together" [Travel Theme]. We walked, we prayed, several times, and now we have to work a bit - and even eat, afterwards. However, we see that walking together brings fruit: today, hospitality. We have seen that, after so many years of dialogue, there is mutual respect and something more: there is also friendship. But there is still a lot of work to do and many challenges, and this is of interest to us normally: the challenges. Thank you for your work! It was a rather heavy day, at least for me. But I'm happy. I am happy because the different things we have done, both the prayer at the beginning, then the dialogue during lunch, which was beautiful, and then the Mass, are things that made me happy. Tired, but they are good things. Thank you very much. And now, I'm at your disposal. Holy Father, estuvo en Ginebra pero también en Suiza. ¿Qué imágenes, qué momentos importantes, fuertes, ha marcado during esta jornada? Thank you. I believe that - I would say - there is a common word: meeting. It was a day of meetings. Variegated. The right word of the day is meeting, and when one person meets another and feels pleasure of the meeting, this always touches the heart. These were positive, even beautiful, encounters, starting with the dialogue with the President [of the Swiss Confederation], at the beginning, which was not only a dialogue of courtesy, normal, but a profound dialogue, on deep world issues and with an intelligence that you hit me. Starting from this. Then, the meetings that you have all seen ... And what you have not seen is the meeting of lunch, which was very profound in the way of touching so many topics. Perhaps the topic on which we have been more time is that of the young, because even all the Confessions are concerned, in the good sense, for the young. And the pre-Synod that was done in Rome, from March 19 onwards, attracted enough attention, because they were young people of all the Confessions, even agnostics, and of all countries. Think about it: 315 young people present and 15 thousand connected online who "came and went". This perhaps woke up a special interest. But the word that perhaps gives me the whole trip is that it was a journey of encounter. The experience of the meeting. Not mere courtesy, nothing purely formal, but human encounter. And this, between Protestants and Catholics, is to say everything ... Thank you. Thank you, Holiness. Now the German group is Roland Juchem, of the German Catholic CIC. Thank you, Holy Father. You often talk about concrete steps to be taken in ecumenism. Today, for example, he once again reported it by saying: "Let's see what can be done concretely, rather than discouraging us from what is not". Then, the German bishops, lately, have decided to take a step [on the so-called "inter-Communion"], and then we wonder why Archbishop Ladaria [Prefect of the Congregation for the Doctrine of the Faith] wrote a letter that seems a little like an emergency stop. After the meeting on May 3rd, it was stated that the German bishops should have found a solution, possibly unanimously. What will be the next steps? Will an intervention by the Vatican be necessary to clarify, or will the German bishops have to find an agreement? Good. This is not new, because the Code of Canon Law provides for what the German bishops were talking about: Communion in special cases. And they looked at the problem of mixed marriages: whether it is possible or not possible. However, the Code says that the particular bishop of the Church - this word is important: particular, if it is from a diocese - must manage this thing: it is in his hands. This is in the Code. The German bishops, because they had seen that the case was not clear, and also that some priests did things not agree with the bishop, they wanted to study this theme and they did this study that - I do not want to exaggerate - was a study of more than a year, I do not know well but more than a year, well done, well done. And the study is restrictive: what the bishops wanted is to clearly say what is in the Code. And I, too, read it, I say: this is a restrictive document. It was not "open to everyone". No. It was well conceived, with an ecclesial spirit. And they wanted to do it for the local Church: not the particular one. They did not want to. The thing has slipped up to there, that is, saying it is for the German Bishops' Conference. And there is a problem, because the Code does not provide for this. It foresees the competence of the diocesan bishop, but not of the Episcopal Conference. Because? Because something approved in an Episcopal Conference immediately becomes universal. And this was the difficulty of the discussion: not so much the content, but this. They sent the document; then there were two or three meetings of dialogue and clarification; and Archbishop Ladaria sent that letter, but with my permission, he did not do it alone. I told him: "Yes, it is better to take a step forward and say that the document is not yet mature - this was what the letter said - and that we had to study the matter more". Then there was another meeting, and eventually they will study the thing. I believe this will be a guiding document, because each of the diocesan bishops can manage what canon law already permits. There was no braking, no. It was a matter of managing the thing to get on the right track. When I visited the Lutheran Church in Rome, a question like that was made and I responded according to the spirit of the Code of Canon Law, the spirit that they [the bishops] are now seeking. Maybe there was not just information at the right time, there's a bit of confusion, but that's the thing. In the particular Church, the Code permits it; in the local Church, it can not, because it would be universal. And this. Is the local Church the Conference? ... it is the Conference. But the Conference can study and give guidelines to help the bishops deal with particular cases. Thank you. Now, the Spanish group is Eva Fernández of the Cope, Spanish Radio. Thank you, Holy Father. We have seen that the Secretary General of the World Council of Churches also spoke about aid to refugees. Lately we have seen the accident of the ship "Aquarius" and other cases, as well as the separation of families in the United States. Do you think that some governments exploit the drama of refugees? Thank you. I spoke a lot about refugees and the criteria are in what I said: "welcome, protect, promote, integrate". These are criteria for all refugees. Then I said that every country must do this with the virtue of government that is prudence, because a country must welcome as many refugees as it can and those who can integrate: integrate, that is educate, give work ... This, I would say, is the quiet plan, peaceful refugees. Here we are experiencing a wave of refugees fleeing war and hunger. War and hunger in many countries of Africa, wars and persecution in the Middle East. Italy and Greece have been very generous to welcome. For the Middle East - regarding Syria - Turkey has received so many; Lebanon, many: Lebanon has as many Syrians as there are Lebanese; and then Jordan, and other countries. Even Spain had welcomed it. There is the problem of the traffic of migrants. And there is also the problem of cases in which they return, because they have to return: there is this case ... I do not know the terms of the agreement well, but if they are in the Libyan waters they have to return ... And there I saw the photographs of the prison traffickers. Traffickers immediately separate women from men: women and children go God knows where ... They do the traffickers. There is also a case, I know, in which the traffickers approached a ship that had received refugees from the boats and said: "Give us women and children and take the males away". This is the traffickers. And the prisons of the traffickers, for those who have returned, are terrible, they are terrible. These things were seen in the lagers of World War II. Even mutilations, torture ... And then they throw them into the mass graves, the men. This is why governments worry that they will not come back and fall into the hands of these people. There is a world concern. I know that governments are talking about this and they want to find an agreement, even to amend the Dublin Agreement. In Spain, you have had the case of this ship that arrived in Valencia. But all this phenomenon is a disorder. The problem of wars is difficult to solve; the problem of the persecution of Christians also, in the Middle East and also in Nigeria. But the problem of hunger can be solved. And many European governments are thinking of an urgent plan to invest in those countries, to invest intelligently, to give work and education, these two things. In the countries from which these people come. Because - without offending, but it is the truth - in the collective unconscious there is an ugly motto: "Africa must be exploited" - Africa es para ser explotada. This is in the unconscious: "Eh, they are Africans! ...". Land of slaves. And this must change with this plan of investment, education, development, because the African people have so many cultural riches. And they have a great intelligence: the children are very intelligent and can, with a good education, go further. This will be the medium-term road. But at the moment governments must agree to move forward with this emergency. This, here in Europe. Let's go to America. In America, there is a big migration problem in Latin America, and there is also the internal migration problem. In my homeland there is a migration problem from the north to the south; people leave the countryside because there is no work and they go to big cities, and there are these megalopolis, slums, and all these things ... But there is also an external migration to other countries that give jobs. Speaking concretely, towards the United States. I agree with what the Bishops of that country say. I support them. Thank you. Thank you, Holiness. Now, the English group: Deborah Castellano Lubov, from the Zenit agency. Thank you, Holiness. Holiness, in your speech today at the Ecumenical Meeting, you referred to the enormous power of the Gospel. We know that some of the Church of the World Council of Churches are so-called "Churches of Peace", which believe that a Christian can not use violence. Recall that two years ago, in the Vatican, there was an organized conference to reconsider the doctrine of the "just war". So, Holiness, the question is whether you think it is the case for the Catholic Church to join these so-called "Churches of Peace" and put aside the theory of "just war". Thank you. A clarification: why do you say that there are "Churches of Peace"? They are considered "Churches of Peace" because they have this conception that a person uses violence can no longer be considered Christian. Thanks, I understand. She put her finger in the wound ... Today, at lunch, a Pastor has said that perhaps the first human right is the right to hope, and this I liked, and falls a bit 'in this theme. We talked about the human rights crisis today. I think I have to start with this to get to your question. The human rights crisis appears clear. There is a bit of human rights, but many groups or some countries distance themselves. Yes, we have human rights but ... there is not the strength, the enthusiasm, the conviction I do not say 70 years ago, but 20 years ago. And this is serious, because we have to see the causes. What are the causes for which we have arrived at this? That today human rights are relative. The right to peace is also relative. It's a human rights crisis. This I think we have to think about it thoroughly. Only, one word I want to say clearly: that today was an ecumenical day, just ecumenical. And at lunch we said a good thing, which I leave to you to think about it and reflect on it and make a nice consideration on this: in the ecumenical movement we must take one word out of the dictionary: proselytism. Clear? There can be no ecumenism with proselytism, one must choose: either you are ecumenical, or you are a "proselytist". And now, let's bring the Substitute [of the Secretariat of State] because it is the last trip he takes with us, because now he will change "color" [becoming Cardinal]: but not out of shame! We want to dismiss him and there will be the Sardinian cake to celebrate. Thank you! It's a double surprise, call me here and thank me in front of you. And then a Sardinian cake ... good !, we will taste it with pleasure. 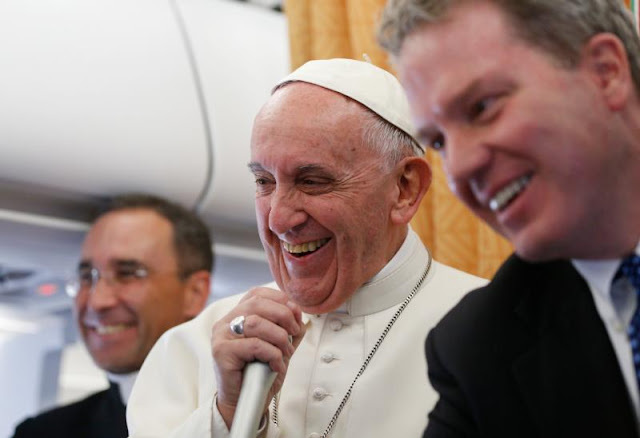 I really thank the Holy Father for this occasion, but for everything, for everything, because he made me do this wonderful experience of traveling with him a lot. At the beginning, he had frightened me, he had said: "No, I will do a few trips", do you remember? And then, after one he added another, and another, and we said: "Thank God he said they would be few! ", And they were many. A magnificent experience: to see the Holy Father courageously spread the Word of God. My service was only this: to help him in this. Thanks to all of you and to those who helped us. Thank you. Enjoy your meal, have a nice dinner and thank you very much. And pray for me, please. Thank you.